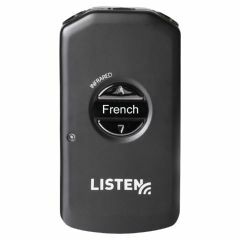 AllegroMedical.com presents the Listen Technologies iDSP LR-4200-IR Receiver. The LR-4200-IR is a high performance IR receiver with extreme sensitivity providing the superior pickup and range! LR-4200-IR is the smallest device of its kind making it easy for end users to wear and operate and easier for the venues to dispense store and maintain. Use the LR-4200-IR for an exceptional listening experience in places where it's difficult to hear like: theaters lecture halls concert venues houses of worship and more.